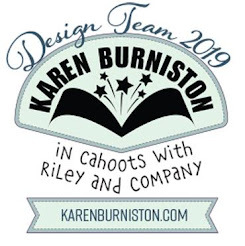 It's my turn to post a tutorial on the Elizabeth Craft Designs blog today for the Die Cut Design Team. 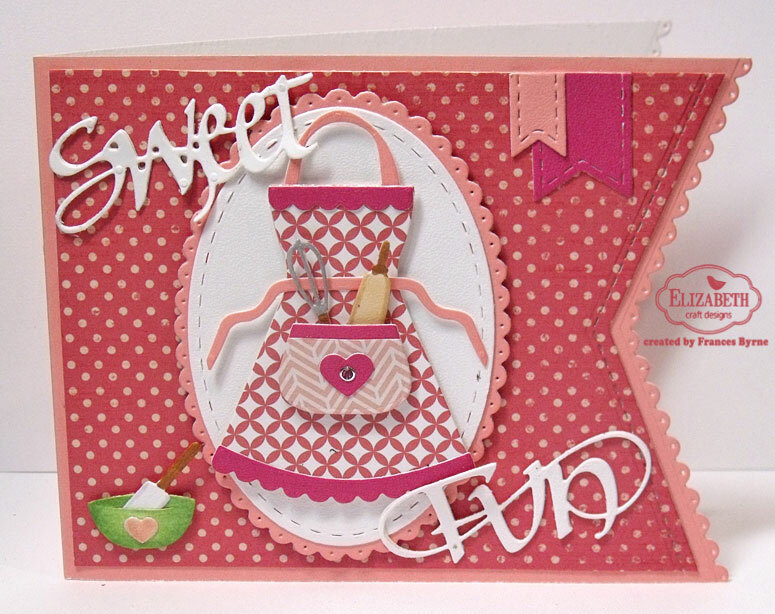 I love making cards which are a little different to just the normal square or rectangle cards. 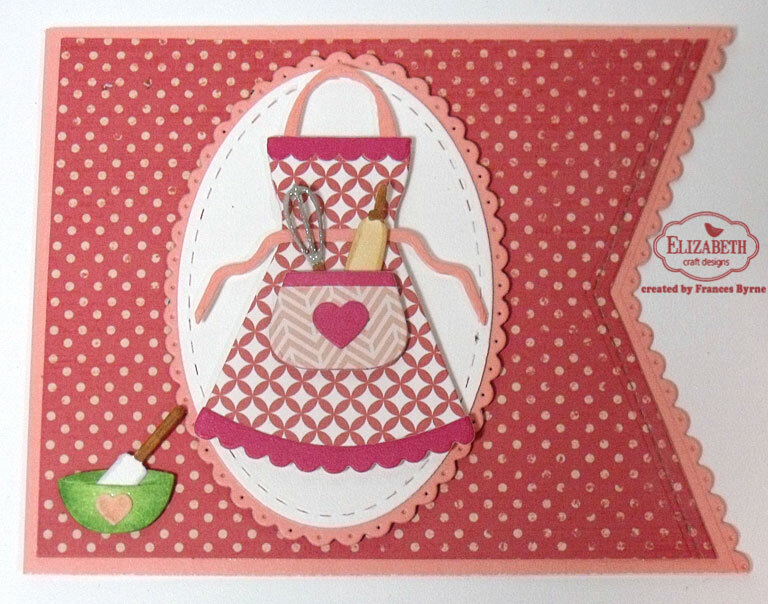 Today I have used the Fishtail Borders die set from Els van de Burgt Studio to add a fishtail edge to my card. To decorate my card I have used dies from Joset Designs and A Way With Words. 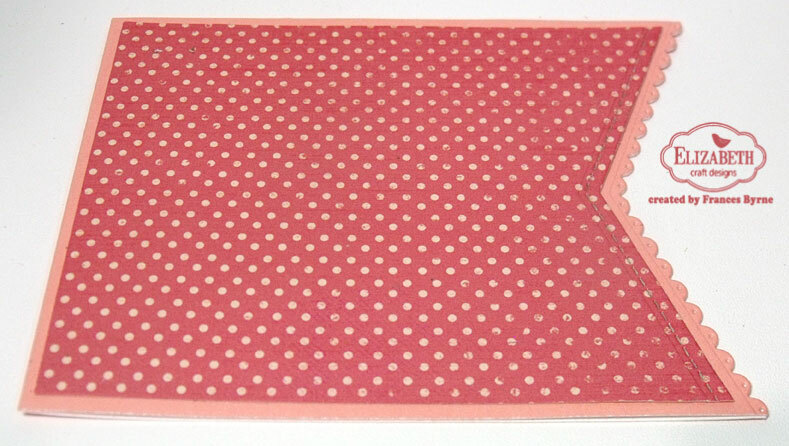 Cut a piece of Pink Peach Soft Finish Cardstock that measures 4 1/2 inches x 11 1/2 inches. Score along the 11 1/2 inch edge at 5 3/4 inches. Find the centre of the card (I used a centreing ruler see photo above). Place the scallop fishtail border from the Fishtail Borders die set so that the point of the die is at the centre point and the tails of the die are even at the edges. Run through die cutting machine. Save the negative die cut piece (the piece that is removed from the card) as we will use this for the inside. Cut a piece of designer paper that measures 4 1/4 inches x 5 1/2 inches. Find the centre of the designer paper as we did on the folded card. Place the Stitched Fishtail Border from the Fishtail Borders die set so that the point of the die is at the centre point and the tails of the die are even at the edges. Run through die cutting machine. Adhere the designer paper fishtail layer to your folded card. 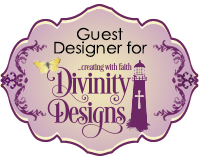 Using the second smallest oval from the Stitched Ovals die set, die cut an oval from White Soft Finish Cardstock. 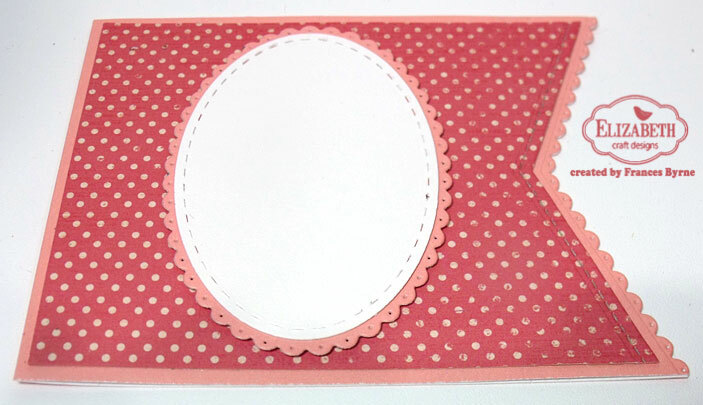 Using the third smallest oval from the Dotted Scallop Ovals die set, die cut an oval from Pink Peach Soft Finish Cardstock. 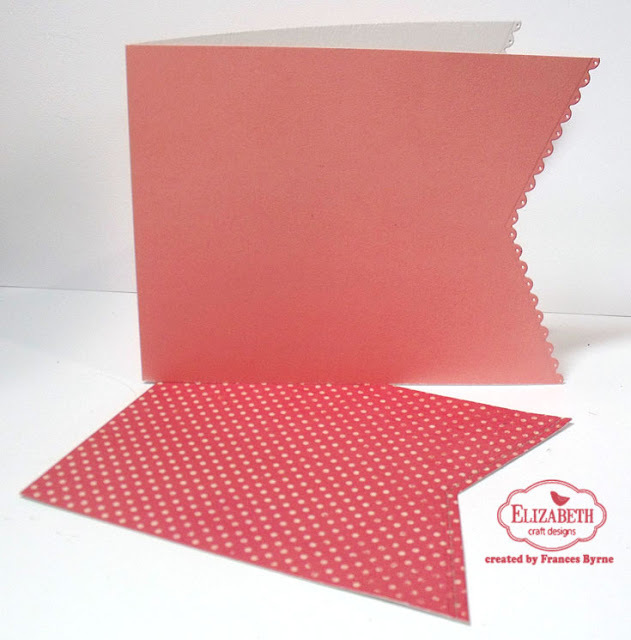 Layer the two ovals together and adhere to the centre of card using foam tape. Assemble the Apron using photo above as a guide. Adhere to the oval using foam tape. Add a Pink/Silver Glitter Dots Peel Off Sticker to the heart on the apron pocket. (1) Each Rolling Pink; Spatula & Whisk from White Soft Finish Cardstock. Color Kitchen Tools using Copic Markers. Create a slit in the bowl and add Spatula to bowl. Add Kitchen Tools to card referring to photo above as a guide. Using the "Sweet" from the A Way with Words - Sweet Smiles die set and the "Fun" from the A Way with Words - Fun Play die set, die cut from White Soft Finish Cardstock. (I die cut each word twice and layered them together for extra height, but this is optional). Adhere the sentiments to the card referring to the photo above as a guide. Using the two smaller fishtail banners from the ModaScrap Stitched Fishtail Banners die set, die cut one each from Pink Peach and Rosebud Soft Finish Cardstock. 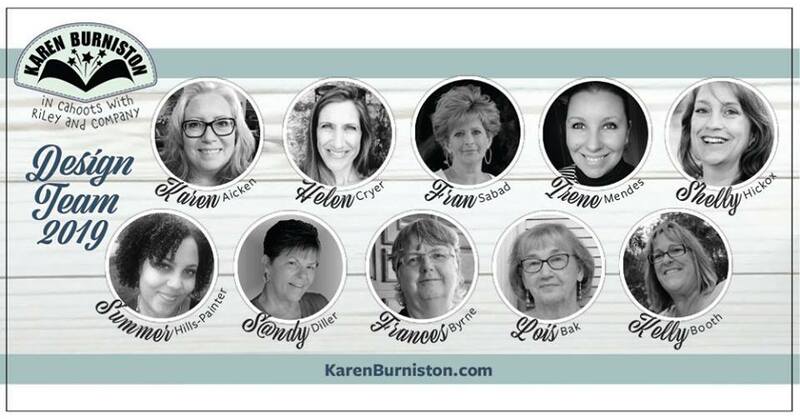 Offset the the smallest fishtail banner over the larger fishtail banner and adhere to the top right hand edge of the card. Layer the negative die cut pieces which were left over from when we cut the fishtail shape from the folded card and designer paper. Adhere to the left hand side of the inside of the card. 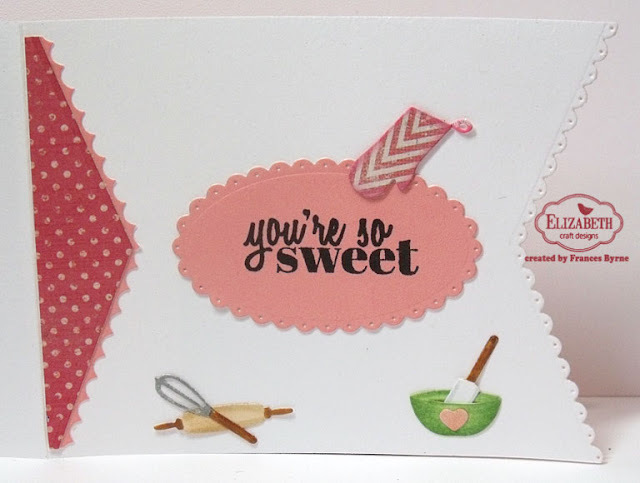 Using the "You're so sweet" sentiment from the General Sentiments die set, stamp using black ink onto Pink Peach Soft Finish Cardstock. Die cut the sentiment using the smallest oval from the Dotted Scallop Ovals. Adhere to the inside of the card so it is centred between the fishtails on either end of the card. OMGoodness, this is so cute.